Holy Mary of the Snows, pray for me! 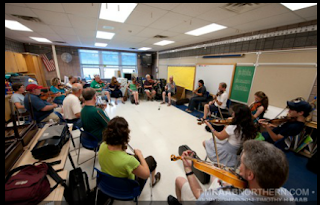 Every summer since I was sixteen (that is, since 2001), I've headed to the hamlet of East Durham in the Catskill Mountains for Catskills Irish Arts Week. It is incredibly good craic (that's "fun," for those not familiar with the term). This year was no exception. The format of the week is that there are morning and afternoon workshops, lectures in the late afternoon, a concert in the evening, and sessions galore all over town at night. There is also a céilí (social dance with live music) every night. A full-time student takes morning and afternoon workshops while a half-time student takes only one or the other (you take a workshop on the same subject with the same teacher all five days, for instance, you could take concertina Mon-Fri mornings, and beginning set dancing Mon-Fri afternoons). The student badge also gives free admission to the concert and céilí. The lectures are free for anyone to attend, the nightly concert and céilí are $10 per person if you don't have a student badge. The sessions are also open to the public with no cover charge, although it is suggested that you be generous in your drink purchases at the pub where the session is hosted. A lot of people come and take workshops, and even more come just for the nightly concerts, sessions, and dancing. The little town of 200 residents swells to over a 1000 for the week. People come year after year, and you make friends that you might only see or have contact with during that one week. It's like Brigadoon (only with better music--no offense to Messrs. Lerner and Loewe). The week is crowned on Saturday by the Andy McGann Festival, and usually Saturday night features Mass said at the Lady of Knock Shrine by Msgr. Charlie Coen, who is pretty much a permanent feature at CIAW teaching concertina classes. In past years I have been a full-time student, taking variously harp, singing, and step dancing workshops. Last year and again this year, I have eschewed full-time registration and been only a half-time student. This is great, because I was always too tired before to go to the afternoon lectures. This year I made two of them--one on basic Irish language pronunciation (part of a series that went on all week, but I got a lot out of just the first one), and one about the history of the bodhran, which was very enlightening (basically--it doesn't have a history before the mid-20th century). I also eschewed the singing sessions, at which I have in the past been a faithful attendee, since although I've also taken harp classes I really hate dragging it to the instrumental sessions. I would probably have enjoyed hearing more of some of the professional singers who were tasked with playing host at the singing sessions (notably Michael Black of the Black Family, and the Friel Sisters this year--I love Jimmy Crowley too but I've heard him sing quite a bit). So what did I do? I danced. Almost five hours a day. Seriously! I took the advanced set dancing workshop (a type of social dancing a bit like square or contra), and went to a céilí every night for seven nights running. CIAW ran the Mon-Fri dances, while the preceding Sunday night was hosted by the local East Durham Set Dancers (of which my mother is a part), and the following Saturday was courtesy of the Shamrock House pub/restaurant/resort which is the town's main set dancing venue. Saturday's céilí was on-the-house (no cover charge). By Saturday, I was more or less hobbling and only danced two sets, and on Wednesday the venue was hotter than hades and I danced three sets and went home to shower. Every other night I danced almost every set (about 3 hours of dancing), besides having been to the 2.5-hour class in the morning. I loved it, and I lost two pounds. My mom and I joked about starting an Irish-themed weight-loss camp with healthy food and hours and hours of dancing every day. Pádraig McEneany taught the advanced sets this year and called at some of the céilis, and he's absolutely brilliant. He teaches at a good pace, is patient but firm, and notices everything. As a caller, he's really good about telling you the next move just far enough in advance, and giving lots of detail if the set has any unusual features ("House around with crossed hands! Now swing in céilí hold..." etc.). He also made sure that we would do one of the sets that we'd done in class that morning. I'd love to see him back in the Catskills in future years. It was a really great week. If you are at all interested in Irish music or dance, you should give it a try. There is also good music to be found in East Durham on Memorial Day weekend and at the weekend Banjo Burke Festival in October. I must admit, though, that despite all the fun, I was pretty happy to get back to Anchorage, where it's been hovering around 68 degrees all week. I don't miss 95F and 75% humidity! The wildlife here is awesome, and everywhere. This video is from the end of May, as we stood in the living room and watched a mama moose and her baby walk right through our side yard. They had been in the court for almost half an hour but we only taped the last few seconds of their visit. Our dog, Brody, makes some funny noises by way of providing a soundtrack to the video. If you've never seen a moose in person, you probably won't realize exactly how huge they are, but the cars on the street will give you some perspective. And yes, a moose--especially a mother moose--will kick and stomp you if you get in her way, which is why we observe from the safety of our living room. Finally Got to See "Brave"
I've really been looking forward to "Brave" ever since I saw the first still images late last year. A Pixar movie with a female lead? And in a Scottish setting? Huzzah! My husband belongs to Clan Donnachie and wore a kilt at our wedding, and I am a life-long devotee of Irish music and dance. My first Irish dance teacher had hair just like Merida's and I thought she was the most beautiful woman in the world. Plus, I own and shoot guns (I love archery too, but guns have more practical applications in the modern age), and Merida's handiness with a bow appeals to me. 1. 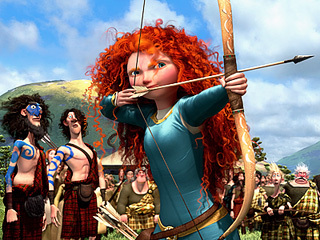 In the past, Pixar has had some really excellent male leads but also well-rounded secondary characters (like Jessie in Toy Story 2 and 3), whereas I thought the characters in "Brave," with the exceptions of Merida and Queen Elinor, were pretty flat. I saw some of the Brave shorts before I saw the film, and those really rounded out the character of King Fergus (especially in his relationship with Merida) in a way that the movie didn't. A couple minutes of Merida riding or whining could have been cut to include the scene of Fergus taking over Merida's lessons for a day, which was cute and helped develop the father-daughter relationship. 2. The whole arranged marriage thing is overdone in movies of this type, and they could have been a little more imaginative about the source of the conflict. 3. The epilogue could have been a minute or two longer. We saw quite a lot of Elinor letting her hair down and riding with Merida and only about two seconds of Merida working on a tapestry with her mother. Elinor has clearly changed and loosened up a lot for Merida's benefit, but if you had blinked you would have missed any indications of long-term change in Merida. And Merida definitely needed to change--although she was right to protest the arranged marriage and some of the strictures her mother tried to place on her, she also allowed her pride to lead her into making a huge mistake, one that nearly cost her mother's life. Merida needed to change, too, not just in her realization that she really loves her mother but also in her behavior in the long-term. Also, the emphasis on Elinor taking up the less-girly tasks, while Merida apparently continues to scorn most of the more feminine behaviors her mother tried to instill does not say good things about traditional femininity. A lot of children's films with female leads these days feature women subverting the traditional order and taking on--and totally pwning--historically male-centered activities. There's nothing wrong with women wanting to ride, shoot, wear their hair loose and have comfortable clothes. These are all things I do myself, and my husband happily brags that I shoot a rifle just as well or better than he does. Nevertheless, I also cook and crochet and occasionally wear slightly uncomfortable clothes just because they are pretty and I want to look girly badly enough to put up with high heels, and these feminine things are praiseworthy in their own way. I don't think it would be awful for the movie to show Merida giving in to her mother a little more. Balance is good. The short epilogue made it seem like there was meant to be a moral to the fable, but they just rushed through it, leaving me unsatisfied by the ending. I'll labor night and day to be a pilgrim. And no, there are no patriotic songs sung at our parish this weekend. There were some complaints about this, but Independence Day isn't until Wednesday. It isn't as if Independence Day is a solemnity that gets transferred to Sunday, even if it were appropriate to since "America the Beautiful" at Mass. Our country needs prayer right now, not adulation. A Roman Catholic who divides most of her time between the kitchen and the choir loft.